The hybrid prepared foods market and restaurant closed suddenly over the weekend. All in all, it was a stunningly fast rise and fall for what had been one of Oakland’s most highly anticipated, and most ambitious, new restaurants. 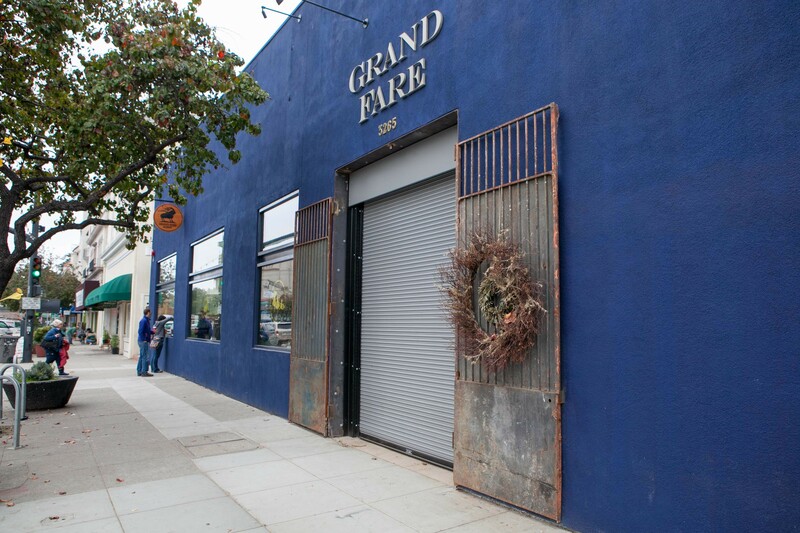 In truth, it seems inaccurate to even label Grand Fare as a “restaurant,” strictly, because it also combined elements of a grocery store, deli coffee shop, bakery, beer garden, and ice cream truck — all of that in a lavishly-appointed 3,500-square-foot indoor and outdoor space. And much of it was wonderful in its way. 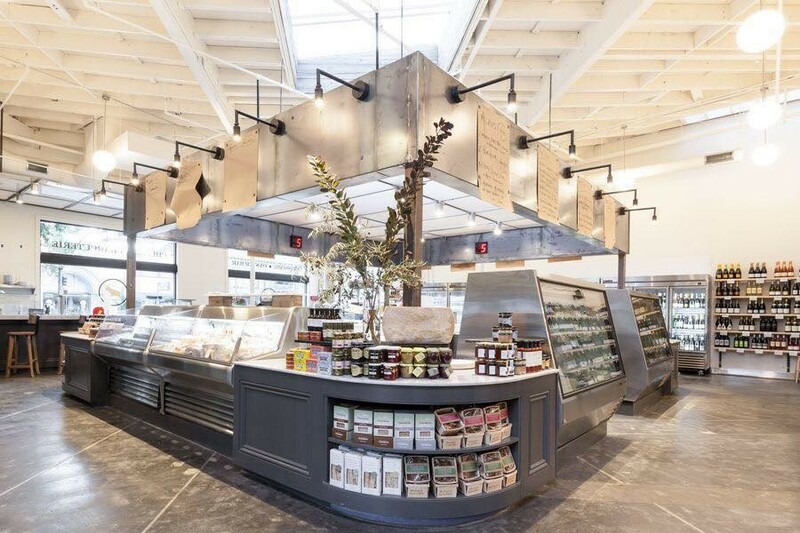 The indoor portion had the look and feel of the kind of luxury grocery store I associate with the ritzy parts of cities like Paris or Tokyo. There were gleaming cases filled with wonderful cheeses, charcuterie, and to-go items such as duck confit and stuffed portabella mushrooms. A carefully curated selection of snacks made by local food artisans was arranged just so. Chipper employees offered samples of the hearty, unusual house-made grain salads that the shop sold by the pound — quaintly, in South Asian-style metal tiffin boxes, for customers who chose to eat in the garden courtyard. And what a garden it was: Tree-lined and lit up with twinkly string lights, so that even on a random weeknight, I felt like I’d walked in on a festive backyard wedding party. A vintage Airstream trailer served pastries in the morning and Humphry Slocombe ice cream in the afternoon and night. The interior of the market (via Facebook). But there were cracks in Grand Fare’s well-polished armor if you were inclined to look for them. The garden, as beautiful as it was, didn’t have a roof, and, apart from a small raw bar inside, it comprised the entirety of the restaurant’s available seating. Business seemed destined to take a hit on cold, rainy days. And the difficulty of finding street parking on that stretch of Grand Avenue likely didn’t bode well for a takeout-oriented business. Still, when I spoke to Washington last week, he talked only of minor tweaks that were in the works — of his desire to simplify the ordering process and to more prominently display the whole rotisserie chickens and other hot entrées. The goal, he said, was to create a feeling of abundance. “You shouldn’t have to stand at the center island and choose like you’re at a restaurant,” he said. What was never in question were the chef’s cooking chops. Coe’s previous gigs were at Commis and the now-shuttered Box & Bells — both high-profile restaurants owned by James Syhabout — and that pedigree showed here, even in seemingly simple dishes. An array of flatbreads were topped variously with thinly sliced lamb and chimichurri — like a suped-up roast beef sandwich — or big chunks of yogurt-sauced Louisiana shrimp so plump and luxurious I nearly mistook them for lobster. Meaty, tandoori-spiced pork ribs were cooked sous-vide, in a temperature-controlled water bath, then finished on the grill. They had just the right texture and were flavorful enough that no sauce was needed. A spinach salad that featured spit-roasted Piri-Piri chicken was as good a chicken salad as I can recall eating this year. Here’s to hoping Coe lands on his feet. But whatever the future holds for the talented chef, it seems unlikely that it will be at Grand Fare, even if Washington does resurrect the concept a few months from now. When reached by phone on Monday, Coe said he didn’t have any more information about the decision to shutter the restaurant than I did. A phone call late Friday night was the only notice he got. “For one reason or another, that’s it,” he said.